Includes register that replaces stubs. View 30 entries per page instead of sorting through multiple stubs. Smal, more convenient size. Includes 20 one-part deposit tickets for every 100 checks. Cover sold separately. Track 3-on-a-page checks easily with our compact register displaying up to 30 entries per page.Executive Deskbook business checks go anywhere with 3-on-a-page convenience - but without messy stubs! 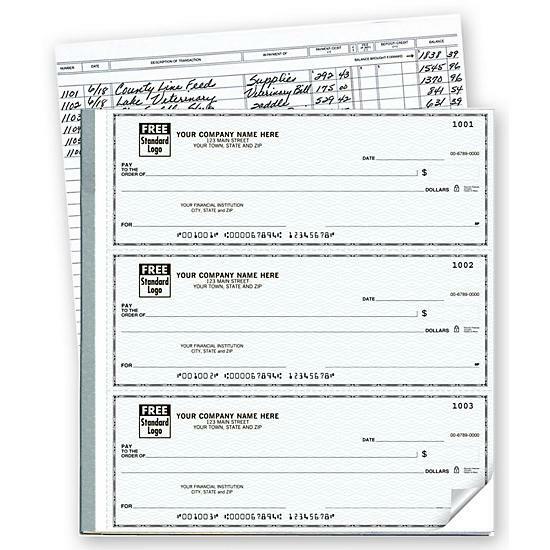 300 checks come with 1 register and 60 deposit tickets, 500 checks come with 2 registers and 102 deposit tickets. 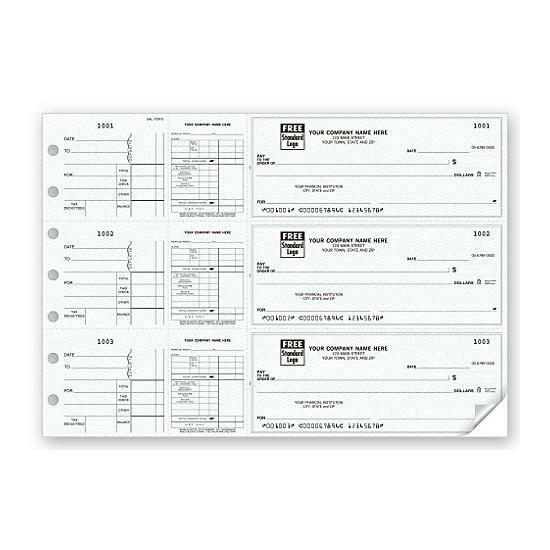 Additional customization options include premium check color, for an additional charge and a custom logo. NCompatible binder (54032) sold separately. 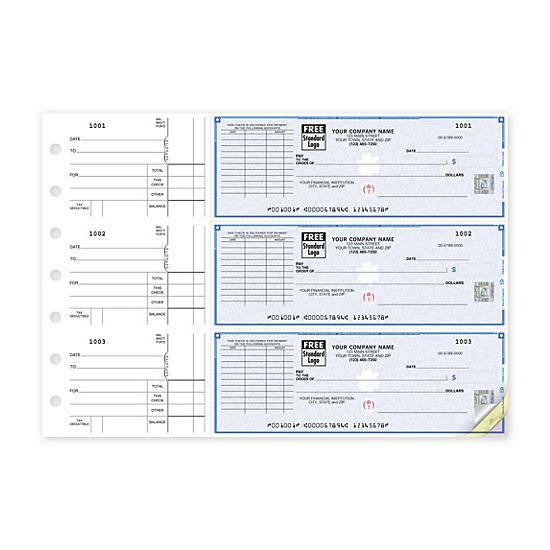 Deposit tickets bound in back of checks. 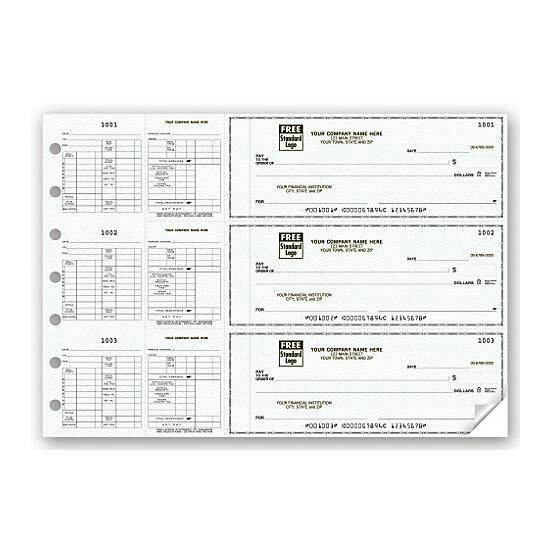 Checks available in 1- or 2-part format. Standard Check Designs: Blue Safety, Green safety, Pink, Tan, & Yellow. Premium Designs: Antique, Vanguard, Tranquillity, Sterling Gentry, American Spirit, Quarry, Gentry, Green Marble. Transaction Information: Routing Number (9 digits), Account Number (1-15 digits) & Check Number. Leather and Vinyl check binder cover available at an extra charge. We have black, blue & burgundy colors for vinyl covers. Typestyle Options: Helvetica Neue Bold, New Century Roman, Melior, and others. Please call for special pricing on larger quantities. Prices include: Printing your heading (up to 5 lines), your financial institution heading (Up to 3 lines).